Dr. Pellegrini received his M.D. in 1971 from the University of Rosario Medical School in Argentina. After training in general surgery in Argentina, he completed a second surgical residency at the University of Chicago. In 1979, he was appointed to the faculty of the University of California San Francisco, where he developed and directed a center for GI motility. An active gastrointestinal surgeon at UCSF, he was recognized on several occasions by residents and students for his teaching. In 1993, he became chair of the Department of Surgery at UW Medicine in Seattle. In 1996, in recognition for his role in the strengthening of the department’s clinical, teaching and research programs, he became the first holder of the Henry N. Harkins Endowed Chair in Surgery, named after the department’s first chair. Dr. Pellegrini is a world leader in minimally invasive gastrointestinal surgery and a pioneer in the development of videoendoscopy for the surgical treatment of gastroesophageal reflux disease and esophageal motility disorders, particularly achalasia. At UW Medicine, he developed the Center for Videoendoscopic Surgery, the Swallowing Center (now known as the Center for Esophageal and Gastric Surgery), and the Institute for Simulation and Interprofessional Studies (ISIS). Dr. Pellegrini serves in many top leadership positions at the University of Washington. 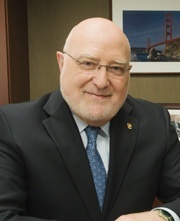 In addition to his role as chairman of the board of ISIS, he is a longtime member of the highest decision-making bodies at UW Medicine, and chairs many committees which oversee an array of topics, including continuous professionalism, diversity, executive search committees and oversight of multidisciplinary practices. He also serves in leadership positions in many regional, national and international surgical associations. He is the past chair of the Board of Regents of the American College of Surgeons. Dr. Pellegrini is currently president of OESO (World Organization for Specialized Studies on Diseases of the Esophagus), chair of the American Surgical Foundation, and a member of the National Advisory Committee of the Robert Wood Johnson Foundation. In 2005–06, he served as president of the American Surgical Association, the oldest and most prestigious organization of surgeons in America. He has been director of the American Board of Surgery and chair of the Digestive Disease Week Council. In the area of medical education, Dr. Pellegrini has been a major contributor to the fundamental reform of residency work hours, having been a member and chair of the Residency Review Committee for Surgery (part of the Accreditation Council for Graduate Medical Education). Dr. Pellegrini serves on several editorial boards and publishes regularly in the field of minimally invasive surgery for upper-gastrointestinal diseases, esophageal cancer and related areas, as well as in the field of training and new technologies to educate the next generation of surgeons. His bibliography lists more than 300 articles, chapters, editorials and books, as well as 11 surgical videos and movies.